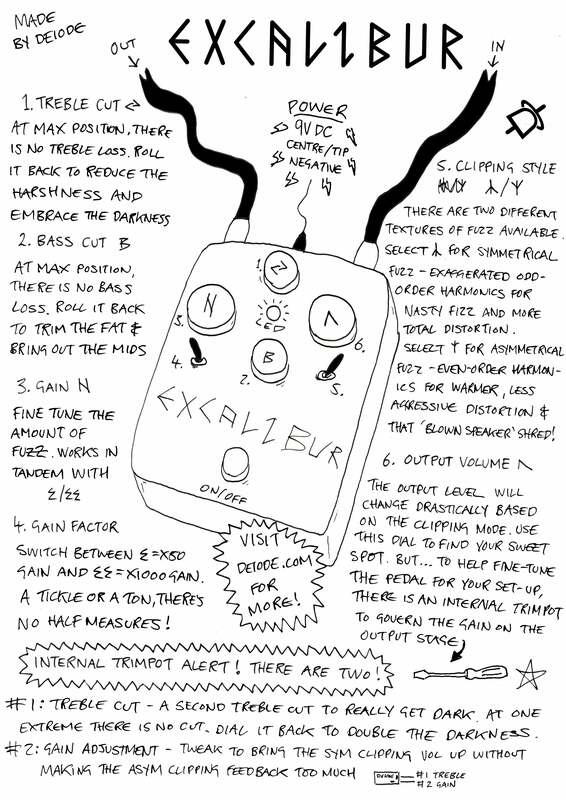 Excalibur is a fuzzbox designed with bass-heavy music in mind. It features two switchable levels of gain, two switchable clipping textures, and bass and treble cut controls. It also has double-stacked lo-pass filters to douse the treble in darkness. TREBLE – At the top of the box is a treble cut dial. All the way up = no cut. All the way down = full cut as far as approx 400hz. Dial in the darkness. BASS – Directly beneath the treble dial is the bass dial. All the way up = zero bass loss. All the way down = full cut as far up as approx 400hz. Strap a girdle on the flab and bring out the midrange for more definition. GAIN – On the left, the gain section provides a switch to flip between x50 and x1000 modes. Just a tickle or full sonic annihilation. Who needs middle ground? Use the dial to fine tune the chaos. VOLUME / CLIPPING STYLE – On the right, the master volume dial governs the overall output. Beneath that is a switch to flip between symmetrical clipping with nasty odd-order harmonic overtones and asymmetrical with sweet even-order harmonic overtones. There is a substantial difference in volume between the modes owing to the nature of the diodes. Use the dial to find the sweet spot for each! 1. GAIN – The first allows adjustment of the output gain stage. This provides a balance between the two clipping modes and can compensate particularly powerful or weak pickups. Set the pedal to asymmetrical clipping and tune the pot to just below the point feedback starts spilling forth! 2. LO-PASS – There is a second lo-pass filter hidden here. It is tuned to wipe out the very highest frequencies, but can be set to provide a sterner treble cut – anywhere from approx 3.3khz upwards. In tandem with the treble control on the outside of the box, this filter allows double treble cut above it’s threshold frequency for maximum darkness. "Hands down bar none the best fuzz pedal on the market"
"Better than my old Russian Big Muff. What an amazing product, it was worth the wait!" "This thing makes my ProCo Rat sound like a mouse. I have never been more pleased with a dirt box!" "Those thinking about pulling the trigger on this should just do it. 1100/10 on the Doom scale"
"If you haven't bought this yet, what are you waiting for? It's f@*king killer!" "Buy it and forget everything you know about fuzz"
Want some power supply advice?